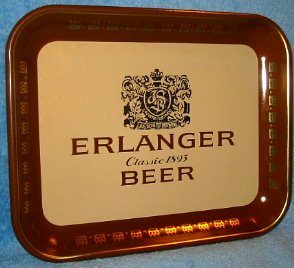 Erlanger Classic 1893 beer tray. 13 1/4 x 10 3/4 inch. I “think” this is from the late 70’s. Heavy metal tray in really nice shape, both front and back. 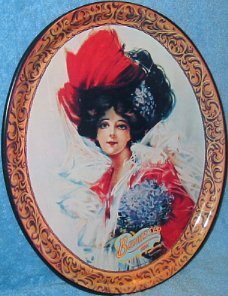 Budweiser Girl beer tray. 10 1/2 x 12 3/4 inch oval. Nice quality, A-B tray dated 1974. Super shape. Has remains of 2-sided tape on the backside. 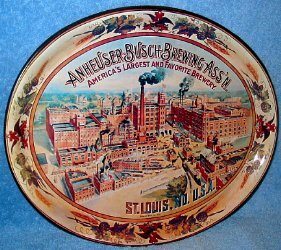 Anheuser-Busch Factory beer tray. 10 1/2 x 12 3/4 inch oval. Nice quality, A-B tray dated 1974. Super shape. Has remains of 2-sided tape on the backside. 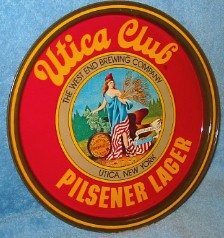 Utica Club Pilsener beer tray. 11 inch round metal. This is one of the more recent versions of the early pre-pro scene. Not sure exactly when it was issued. Super condition. Has remains of some 2-sided tape on the backside. 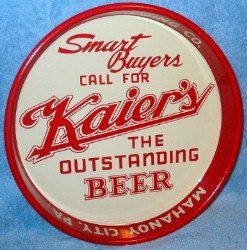 Kaiers The Outstanding Beer tray. 13 inch round. Probably 40’s vintage. Great shape. 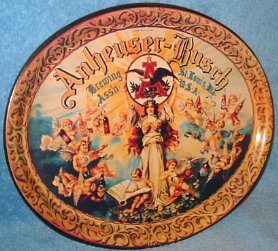 Very hard to find this aluminum tray in this condition. There is a minor ding on the outer rim lip at 4 o’clock. 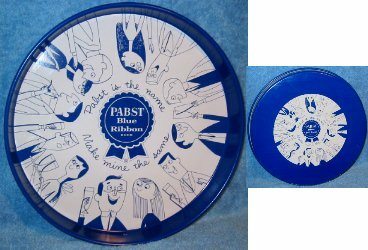 Pabst Blue Ribbon cartoon beer tray. 12 inch round. 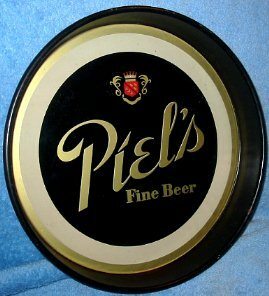 Super shape on this 2-sided tray that is not quite as common as many Pabst trays. 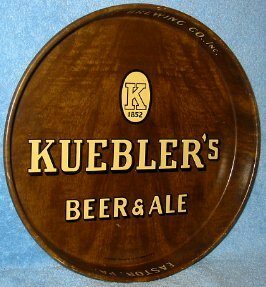 Kuebler’s Beer & Ale woodgrain beer tray. 12 inch round. 1930’s vintage. Some minor outer rim wear and a few vwry minor marks on the front surface. Backside has spidering, but no rust. Very nice example. 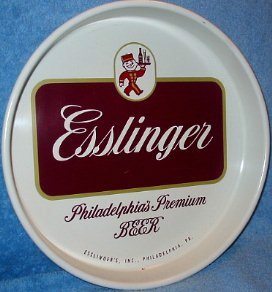 Esslinger Philadelphia’s Premium Beer tray. 13 inch round. Late 50’s vintage. Real nice condition. Just a few very minor marks on the front. Backside has some scattered small rust pits. 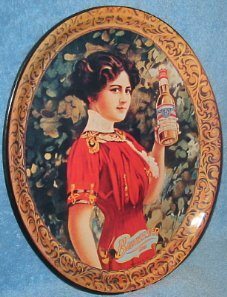 Budweiser Girl holding bottle of Bud beer tray. 10 1/2 x 12 3/4 inch oval. 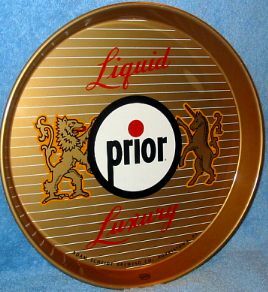 Nice quality, A-B tray dated 1974. Super shape. Has remains of 2-sided tape on the backside.